Fractal Space Time Holograms? Fractal Graphene Metamaterials? This is essentially the fractal trick used in cell phone antennas. Of course General Relativity needs to be fractalized - it's too smooth. Need fractional dimensions. Some French guy did it it in 1970's - was it Notalle? We may need fractal event horizons? This should affect the hologram idea? Susskind showed that Bohm hidden variable paths must be fractal lines as I recall - maybe he did not use Bohm's picture however? Can we make fractal graphene sheets that are also metamaterials? Athena Andreadis, Jason Batt, Elizabeth Bear, Gregory Benford, Kevin M.
Vinterhav, Michael Waltemathe, Christian Weidemann, and David Weiss. Emil Vinterhav Fri 1:30 pm Where's The ___? Christian Weidemann Sat 12:50 pm Did Jesus Die for Klingons Too? CERN report simply a bad measurement! Most likely much ado about nothing. one would have expected the neutrinos to arrive long before the supernova light. Of course, we don't know for sure yet. My bet is that the result is not real. I hope I'm wrong of course - but that's my inclination at the present time. No. This is a very complicated experimental paper. I can't judge it. It need a team of specialists in the field to go over it carefully like the FAA analysing a plane crash. Carlos Castro has a theory. Born’s reciprocal Relativity and which are not present in Special Relativity. Progress in Phys. vol 1, (April 2005) 31-64. Carlos needs to try to calculate the numbers in his theory that would describe the actual data. That would test his theory. This is not an easy task. Good point Z - will have to put in the numbers. That goes back to our earlier discussion only a short while ago - Ray Chiao's goi gravimagnetism effect of Earth's rotation. My first half-baked guess is that it would be too small but maybe not. If it's not measured in a free fall frame, why would it be exactly c? Couldn't the tiny deviations -- if they are not statistical artifacts -- be due to variations in the earth's gravitational field? Jack: only if it's g0i =/= 0. But then it would have to be universal for all particles. Faster than light neutrino measured at CERN? Obviously of extreme interest. Too soon to know if it's not an error of some kind. Check out specific impulse of tachyon beam rocket propulsion. In rockets, due to atmospheric effects, the specific impulse varies with altitude, reaching a maximum in a vacuum. It is therefore most common to see the specific impulse quoted for the vehicle in a vacuum; the lower sea level values are usually indicated in some way (e.g. 'sl'). Theoretically, for a given delta-v, in space, among all fixed values for the exhaust speed the value ve = 0.6275Δv is the most energy efficient with respect to the final mass, see Tsiolkovsky rocket equation. Your opinion for the record? Should shake up the community if true. Does this imply a second metric? 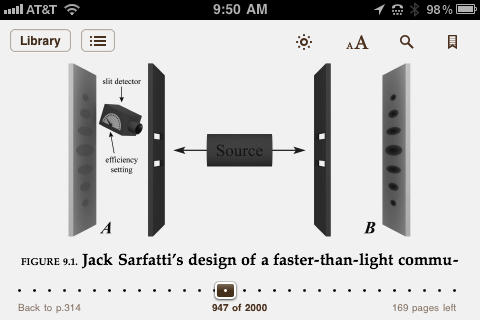 Faster Than Light Back From The Future Entanglement Signals? I took a brief look before (I'll look more later) and remember that you get a total probability of > 1.
and show an observable may be modulated across an entangled state. Is that right? I don't show it explicitly, but I am quite sure it can be modulated in several different ways - will show it explicitly soon in more than one way. 1) the orthogonality of the base states of the sender. 3) the overcomplete Glauber base states are non-orthogonal. 4) Therefore, there is no unitary change of base states that will map sharp number Fock base states to minimum uncertainty wave-packets in number and phase Glauber base states. (Similarly for squeezed variations on the Glauber coherent states). This is the essence of P.W. Anderson's "More is different" Higgs-Goldstone spontaneous symmetry breakdown of the ground state of complex systems in an emergent phase transition to Bohm's new orders of wholeness. In terms of Feynman diagrams you need to sum an infinity of them of a special class to get the ODLRO macroscopic eigenvalue of a single particle or single pair state. One can force my probabilities to add to one by ad-hoc renormalization, but that is a new rule assuming what needs to be tested empirically. Basically, an experiment needs to be done. but it seems to me that if you are correct and you derive a violation of the Born rule without adding anything new to orthodox QM, it shows there must a fundamental inconsistency within orthodox QM (i.e., Born rule cannot be postulated as a condition of the theory). Right. However, the new element is spontaneous symmetry breaking emergence of new higher level order - a non-unitary process with c-number signal order parameters added on to the q-number quantum fields. It's the "phase rigidity" absent in micro-quantum theory that is the new physics analogous to non-zero curvature distinguishing General Relativity from Special Relativity. All the S-Matrix experiments in the LHC for example are done with simple particle beams - not with coherent beams. On the other hand, we know Bohm's theory adds something new (an event description) and is manifestly not restricted by the Born rule. Just my thoughts. I would like to discuss more in Orlando. What I am talking about in Bohm's informal language is a direct back-reaction of the Bohm hidden variable "particle" on its piloting Quantum Potential that is absent in orthodox micro-quantum theory. I am predicting that specially-designed entangled Glauber pair states can be made such that my old idea Fig 9.1 of Kaiser's book will work. Of course if you use the kinds of entangled states that Anton Zeilinger uses in Vienna etc. there are no nonlocal signals there, and the uncontrollable quantum randomness of incoherent individual events (no ODLRO in the low-order density matrices) will protect them as the no-cloning theorem asserts. However, if Zielinger is not careful with his laser sources he may permit Eve to hack in. of course I may have made an error? Regarding the light-speed signal barrier, I'm glad your bringing this issue to the table. As we talked about I think Bohm's theory provides the formalism to break the barrier because Bohm's theory is an "individual event" description. I think we agree, but correct me if I'm wrong. Doesn't the light-speed signal barrier theorem in orthodox QM depend on there not being an "event" description (i.e., QM has a built-in and unavoidable randomness)? Without this "built-in" randomness the light-speed signal barrier theorem breaks down. Yes, he is essentially saying what I have also been saying, except the horizon must be our retrocausal future event horizon not our past particle horizon. The maximum entanglement in the universe increases as the size of the cosmic horizon and this could be related with the arrow of time and dark energy. This idea is in my Journal of Cosmology paper as well Vol 14, April 2011 as well as the archive paper with Creon Levit. Tamara Davis's figs 1.1 & 5.1 modified - bottom shows increase of area-entropy of our future horizon explaining time's arrow. OK some more comments on the paper from Korea. It's a good paper, essentially correct. I actually discussed some of these ideas last night in a brief pop way on Coast to Coast radio before seeing this paper that Kim sent this morning. The paper's logic falls apart at the end mainly because Lee is not clear that the horizon is in our future not in our past. Also Lee talks about a black hole horizon that we are always outside of that corresponds to the AdS/CFT conjecture / < 0 (dark matter). However we are always inside our future cosmological event horizon and that requires some kind of dS/CFT relation / > 0 (dark energy). Lee says no signal nonlocality in Antony Valentini's sense, but I don't think that's correct of course. Lee does not consider entangled macro-quantum coherent Glauber states from the Higgs-Goldstone spontaneous vacuum symmetry breaking, so his model is incomplete. The over-complete non-orthogonality of the Glauber states manifestly violates the Born probability rule from P.W. Anderson's "More is different" "phase rigidity" giving signal nonlocality. However, as Henry Stapp points out, and I independently (e.g., B. J. Carr's review June 2008,) such a property is an extension of orthodox quantum theory to a larger theory like general relativity is larger than special relativity with Valentini's "signal nonlocality" analogous to "curvature." with thermodynamics and holography ..
the inside observer cannot remove the redundancy.